MARSHFIELD, Mass. 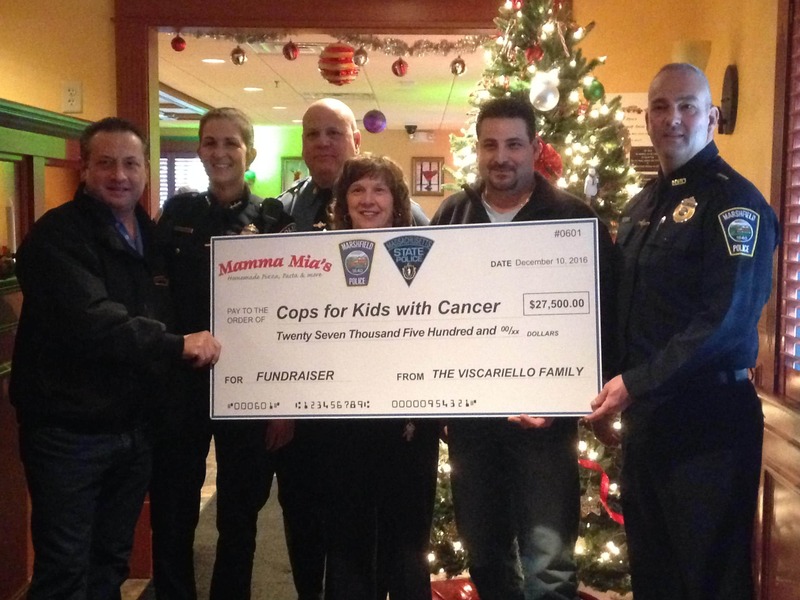 – The Marshfield Police Department and Massachusetts State Police teamed up with the owners of Mamma Mia’s and Carmela’s to be heroes to families who have children with cancer. A fundraiser at the Marshfield Mamma Mia’s on Nov. 17, as well as 10 percent of sales at the six other locations that day, raised $27,500 for Cops for Kids with Cancer. The Marshfield branch offered patrons an all you can eat buffet, local entertainment, raffles and a cash bar for a $20 admission fee for adults and $5 for kids. More than 200 people came out to the Marshfield restaurant for the fundraiser. It’s the second year the restaurant hosted an event to raise money for the organization, and they switched it up a little bit this year, by making it more of a stand-up, mingling event, rather than one where people sit at tables. “This is by far the best fundraiser in the entire state,” said Cops for Kids with Cancer Chairman Bill Coulter, attributing the success to the people involved in making it happen, and the community’s response. Each family who receives money from the organization gets $5,000 to put toward whatever they might need for their family. The money raised through this fundraiser will help more than five families, he said. The nonprofit helps a minimum of six families a month. Since at least one parent often needs to take time off of work to care for the child, the money is meant to help alleviate some of the financial worries the family might be going through—or provide them with the opportunity to make things better for their child. “What we do is give a grant to a family that’s traveling down a difficult road. They can use the money any way they deem necessary. They can go on vacation together,” said Helena Rafferty, president of Cops for Kids with Cancer. She said one family bought a swing set for their child who couldn’t go to playgrounds because the chemotherapy was making her nauseous. Other families might use the money to stay in hotels in Boston while their child is in the hospital, or for parking and food costs that go up when going to Boston hospitals. “Ultimately, we would like to not exist. But until that happens, our goal is to help,” she said. “It wouldn’t have been this successful without the great support of the people in Marshfield,” said State Police Lt. Colonel Thomas Grenham. Marshfield Police Chief Phil Tavares agreed that the support of the community really made the event take off. “Tons and tons of local businesses donated cash and auction items. It was the business community as well as residents,” he said. Grenham said Penney’s work spearheading the fundraiser, and the owners of Mamma Mia’s responding so well, was really admirable.